So far this summer, this is my favorite salad recipe. 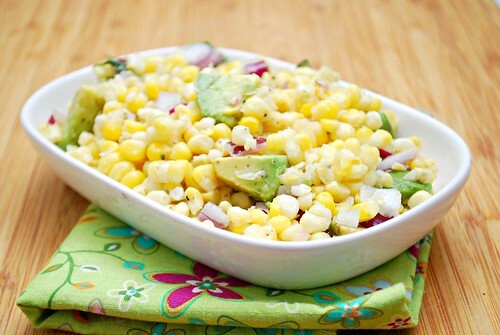 It's easy, quick to make, colorful and definitely a perfect seasonal dish to let sweet corn shine. I guess if you had a hankering for a corn salad when it's not in season, you could substitute the fresh corn for canned or frozen... but it really isn't the same. The freshness makes all the difference both in taste and texture! In a large pot of boiling water, cook corn until tender, about 7-10 minutes. Remove corn from pot with tongs and place on a baking sheet to cool. Once cool enough to handle, cut the kernels off the cob and place into a large bowl. Add the onion, avocado and basil to the bowl. In a small bowl, prepare the dressing by whisking together the vinegar, mustard and olive oil. Carefully pour the dressing into the corn mixture and toss gently to combine. I love this recipe, especially at this time of year when corn is in season! That is an awesome side dish! I would probably pair it with a grilled steak. Yum! You've got my tummy rumbling! I must try this! Oooh, I love corn and avocados! This looks so yummy! Your right, this really needs fresh corn. So great for summer.